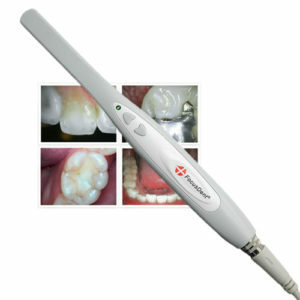 An intraoral camera is a small-scale video camera that takes images of the gums and teeth. The intraoral camera resembles an over-sized pen. While viewing a monitor, the dentist inserts the camera into the patient’s mouth and shifts it about to take images from various angles. Intraoral cameras first came out in the early 1990s. They come in handy in diagnosing dental conditions and in educating the patient. Most patients have misgivings about dental diagnoses that aren’t accompanied by pain or any visual cues. Since the intraoral camera makes use of a computer or TV screen, your dentist can show you if you have a dental condition that needs treatment. The intraoral camera is particularly useful during dental restoration procedures. Your dentist can use the intraoral camera to take before and after pictures and display the results for you to see. The intraoral camera is an extraordinary educational aid, in addition to being a great diagnostic tool. Instead of giving you just a mental picture of what’s happening inside your mouth, your dentist can show you the actual image. Moreover, unlike conventional X-ray images that require processing time, there is no need to wait with intraoral cameras. The real-time images that this tool renders can be an excellent time-saver for both you and your dentist. Time saved with the use of intraoral cameras is exceptionally evident when your dentist needs to take several X-rays at one time. Intraoral camera images are easy to re-take, print, and duplicate. They make it easier to send printouts to dental insurance companies for claims. These images are so useful and convenient that some insurance companies now accept applications via e-mail or messenger. The reduced paper trail cuts down on claim-processing time and is friendly to the environment. This entry was posted in Dental Camera and tagged intraoral camera, intraoral cameras. Bookmark the permalink.